Property for those with a spirit of adventure. 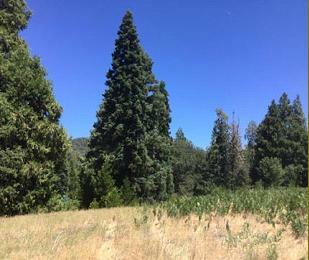 Meadow surrounded by mature cedar, fir and oaks. So many possibilities for this beautiful land the Indians enjoyed decades ago. Large boulders with grinding holes under towering oaks. Well operated with a generator. Building site area on north slope could have a wonderful Observatory view. Well-traveled dirt roads weave through the land. It is landlocked with historic rights and several options for deeded easements. A neighbor just had to have it before I even got the listings posted. So sorry we don't have more options for YOU. Listings needed! Location of pioneer family home site 100 years ago. The cabin is gone now and a park model trailer was brought in to enjoy a beautiful view to the Pedley pond. The pond is now on property now owned by the Water Company. It is very over-grown but the view could be opened up again and be absolutely lovely. Property is landlocked with a couple options. The power is hooked up making so many possibilities for a new owner. Wish we had a dozen of these properties for you. This was purchased by a neighbor before processing. 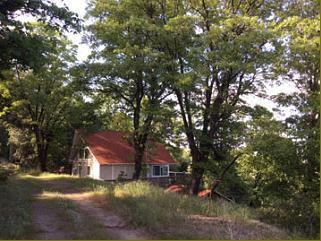 Built and used as a wonderful weekend retreat in peaceful, private Pedley Valley. So many fun areas to discover and explore. 20x12 cabin and packed full of fun with a pot belly stove, kitchenette, toilet and loft. The garage is for the important stuff - the tractor and gator, which are negotiable! Several miles of dirt roads and trails weave through the property. 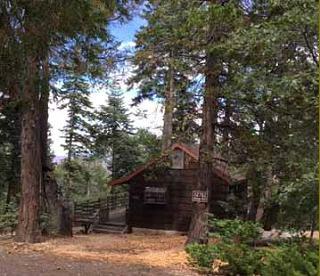 A pump and well shed are near the cabin. Then you'll see the 500 gal water tank up on the hill. Eventually we'll come to the Lookout. A great spot for picnics, looking out to the Observatory. Head down through the valley to the Pond Overlook. It has a 7 by 12 deck and a little shed for your chairs, barbecue and sleds. Like to continue the tradition of a family retreat? This just might have your name on it! I have the key to the Gator so it will make a fun tour! See forever! Building site has spectacular sunset views w/ribbon of ocean. Rolling hills dotted with oaks, reminiscent of Napa Valley. Would you like to plant a vineyard? This may work out beautifully for you. 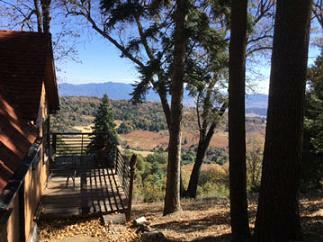 Tucked away at the base of the mountain in the Cuca Ranch area of upper Pauma Valley. Very private & peaceful view building site. Owners recently had driveway graded and a pad area where your dream home could be looking out over the valley and a pond, far below. Neighboring homes are nice, higher-end, in small community served by the West Cuca Mutual Water Company. Power runs underground along your driveway entrance. 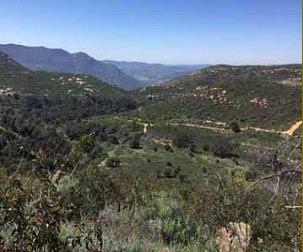 Here is another opportunity for you folks dreaming of building on some amazing view land! See the Southern California coast line, San Diego downtown, Point Loma and the Coronado's. There are some Four Season pix to tempt you! Lots of beauty to be seen year round with frontage on State Park Road. The buildable area is designated by the county and includes this peaceful, private view. 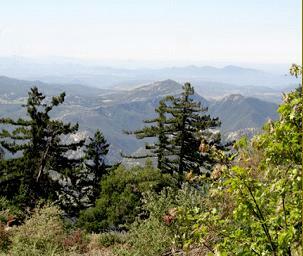 Come see for yourself the potential available from this 58 acres of adventure! "Welcome to a 2017 cabin on a 1935 frame!" It is pretty much all brand new and remodeled with beautiful craftsmanship. Exterior and interior professionally painted with inviting red doors. The foundation and the framing above the walk-out basement has new beams, new plumbing, electrical, insulation, and a 16x10 laundry and storage room under the house. Brand new forced air heat. Refinished vintage but insulated wood floors. 2 bedrooms, storage loft, now approx. 910 sf. Kitchen was gutted, leveled, all new plumbing, insulation, granite counters, all new appliances… Bathroom is all new, also. All light fixtures are new and outlets replaced. Windows throughout were leveled so they all open properly. New interior paint. The cabin was wired for TV with an antenna for lots of channels, a telephone is installed. Move in ready for YOU! 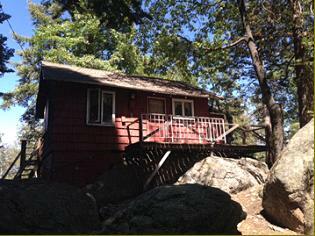 Very inviting cedar deck to escape on recently surveyed 1/2 acre with excellent access. You could LIVE here! 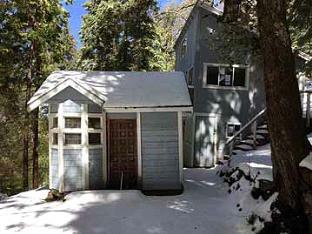 Vintage cabin from 1950 w/great year-round access. Read the charming history link from daughter of the original owner/builders to learn about how the name came to be. Now 966 sf with a fireplace, tall open beam ceiling and stairs to stand-up loft. Roomy bedroom & enclosed porch for a couple twin beds. Eat-in country kitchen and bathroom are waiting for you, too. You'll also find laundry hookups in a little shed & a tiny garage under the deck. Cars were smaller way back then so this is a great place for a workshop and those sleds. 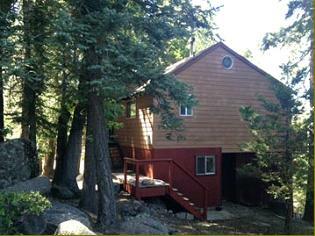 Amazing privacy because of topography and being a distance away from neighboring cabins, even though it is on .1 acre. Grab that tool box as it's a fixer then come enjoy our four seasons of fun! Step back in time! 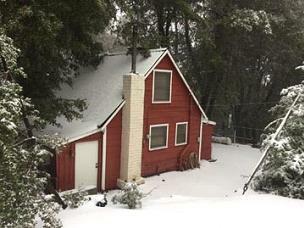 A vintage fixer cabin and a garage! Big stone fireplace, open beam ceiling, big loft… and (drum roll) uneven floors! Beautiful cook stove in the huge country kitchen-- burns wood and propane! Pretty special. 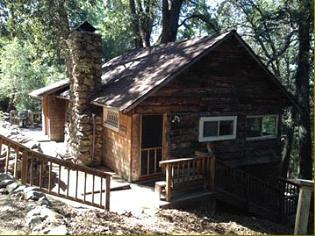 Situated on nearly a half acre, the cabin from 1924 has a bedroom on the main level. You also can take the ladder up to a good-sized loft with room for three beds. A trap door in the kitchen takes you to a walk-out basement that really needs love but has the washer dryer and an area that was used in the past as a little sleeping room and kitchenette. It would be pretty easy to add real stairs to the basement. And the garage? A bunk room or fun game room! Oh my, so many options! 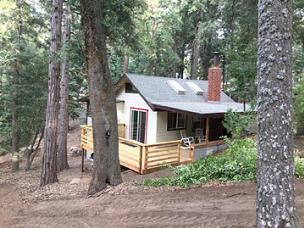 The cabin has new stairs, deck, and retaining wall. It was painted, new carpet was installed upstairs. So, this little gem could be a fun, tiny hideaway. Must have 4W Drive to get to the cabin. Oh, you could get to the cabin driving anything you want, down that very steep road, I'm guessing. But, do you want to get back out? That would be a 4W drive. The little shed out front has a dozen leaded glass windows. Walk-out basement was enclosed years ago to be a bedroom with a half bath. Upstairs is the main cabin with a kitchenette, wood burning stove, full bath and electric heater. A ladder that leads to a loft that has had a queen and twin bed. 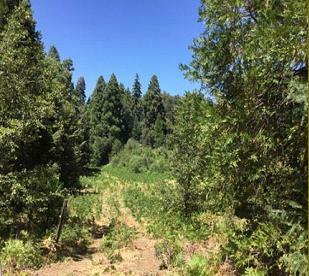 Heavily forested half acre. Bank owned and the bank just lowered the price--again! Out on the easterly side of Birch Hill your walks through the neighborhood take you by spectacular views, off-mountain views. Sunny location with some big, beautiful trees. 1/4 acre with good access and parking from the country road. It has been a much-loved, sweet little cabin with a big open beam ceiling in the living area and a cozy wood burning stove. There is a propane furnace to turn on for a few minutes to take the chill off while you're building that fire. A cozy sleeping nook plus a ladder takes you to the loft. Two half baths. Power and water. Phone and internet available. It's a gem in the making, so bring your tool box as most of the cabin is pretty original from 1946. Come restore to be a perfect weekend getaway with the big deck and forest view. Owner may carry. Looking for a VIEW? You found it! You border soon-to-be National Forest!!! A 575 acre back yard!!! 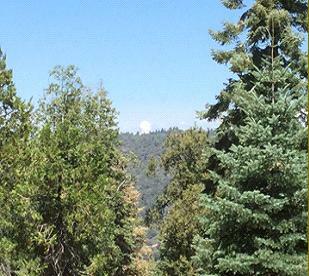 See Lake Henshaw, Laguna Mountains, Warner's Valley and beyond from this very private setting. The cabin had it's beginnings in 1964 as a Boy Scout Lodge so have insignias branded on the beams in the great room. Wait until you see it now!!! The owners are finishing up remodeling the bathrooms with beautiful tumbled stone and travertine. 1528 sf with a big, open kitchen and living area where you sit around an efficient fireplace insert that really keeps you toasty. A master bedroom/game room and large loft on 3/4 of an acre but feels like hundreds... O what a view!